More than 24 years after the event, and to prevent a battle with the newspaper in the courts, Israeli military censors cleared for publication by Yediot Ahronot a truth – that it was Israeli commandoes who, on 16 April 1988, went all the way to Tunis to murder Abu Jihad, the co-founder with Arafat of Fatah and, at the time of his death, Arafat’s number two and most likely successor in the event of his assassination. Zionism as the Recruiting Sergeant for Violent Islamic Fundamentalism (Palestinian Style). December 1987 saw the start of the first intifada or Palestinian uprising in the occupied West Bank and Gaza. As it gathered momentum it captured and held the Western media’s attention, demonstrating once again that it was only when Palestinians resorted to violence, in this case stone-throwing, that their cry for a measure of justice was heard. The explosion of Palestinian anger which became the first uprising against Israeli occupation was spontaneous, but Arafat and his leadership colleagues had anticipated it and made plans to sustain it. Even as he was sailing away from Beirut for Tunis in August of 1982, Arafat was thinking about how to play the “internal (Occupied Territories) card”, to prevent the PLO being cancelled as a factor in the Middle East peace equation. The following year he ordered a “General Exercise” in and around Nablus. “General Exercise” was the code for a confrontation between the PLO’s supporters and the occupying Israeli army. It was Arafat’s way of testing the feelings and mood of Palestinians throughout the Occupied Territories. The response was exactly what Arafat and Abu Jihad had predicted it would be. The confrontation in Nablus took place, but there was no support for the idea that it should be sustained and extended. A popular uprising was still the stuff of dreams. What explained this enormous shift of popular opinion, a change of heart which suggested, among other things, that Arafat’s moderate PLO was in danger of becoming an irrelevance in the Occupied Territories? The first was the realisation that Arafat’s policy of politics and compromise with Israel was getting the Palestinians nowhere. The second, a bitter lesson for a new generation of Palestinians, was that they were on their own when the crunch came. The proof was the way the Arab regimes had sat on their backsides and watched for weeks as Sharon tried to finish the PLO in Beirut. The violent Islamic fundamentalism (Palestinian style) that Arafat and his leadership colleagues saw coming as the inevitable product of continuing Israeli occupation and the new wave of Palestinian resistance would be institutionalised in 1988, when Hamas was founded in Gaza by Sheikh Ahmed Yassin, a paralysed, wheelchair-bound religious teacher. In Arabic Hamas means zeal. It is also an acronym for the Islamic Resistance Movement. For Arafat the consequences of Islamic fundamentalists making the running in the Occupied Territories were terrifying. (As they ought to have been to rational Israelis). First there was the obvious danger that the PLO would become an irrelevance for a majority of Palestinians. But that was not the worst-case scenario. If there was a popular uprising, and if the Islamic fundamentalists could claim most of the credit for it, Arafat – even if the PLO did retain some credibility – might not be able to deliver the compromise that he had struggled for six years to sell to his people. So what at the beginning of 1984 were Arafat and his leadership colleagues to do? They knew they could not force the pace in the Occupied Territories and that a popular uprising would have to be spontaneous, generated from within; but they set about planning and putting into place the support networks and mechanisms that would sustain the explosion of despair – prevent Israeli’s military and other security services putting it down with speed – when it happened. 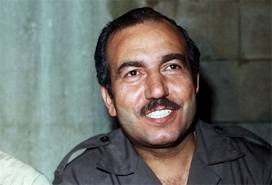 Soon after it started on 9 December 1987 the day-to-day management, direction and co-ordination of the first intifada was, in fact, taken over, as planned, by Abu Jihad, then Arafat’s deputy and most likely successor as well as commander of the PLO’s scattered and mission-less military forces. But Arafat’s personal contribution to sustaining the uprising was significant. He had what he described to me as his “secret weapon”. From a British company (Racal-Tacticom in Reading) he had purchased some state-of-the-art, space-age radio equipment – a transmitter and scores of mini-receivers – which enabled him to plug into the Arab communications satellite (AbSat) and talk directly to Palestinian demonstrators on street corners when they were confronting the Israeli army. It was, however, Abu Jihad’s oversight management and control, from the bedroom of his modest, whitewashed villa in Sidi Bou Said, a suburb to the north-east of Tunis, that prevented the Israelis from putting down the first intifada as quickly as they had assumed they could by collective punishments, arrests, torture and killing. That was why, on 16 April 1988, Israeli Special Forces went all the way to Tunis to assassinate Abu Jihad in his bedroom. Though it was enclosed by a wall eight feet high, the villa occupied an exposed corner position at a road junction inside what many local people described as the “Forbidden Zone” because of its security status. The Tunisian president’s palace and the American Ambassador’s residence were almost within shouting distance of Abu Jihad’s villa. When he was looking for a family home he had been directed to the location by Tunisian officials. They told him there was no other place where his security could be guaranteed. When the Israelis came ashore they were dressed as Tunisian security forces. They knew it was going to be an easy kill because Israeli agents had done a thorough reconnaissance job. They had discovered that Abu Jihad refused to surround himself with bodyguards of his own, in order to live as normal a life as possible with his childhood sweetheart and their children. From Israel’s point of view Abu Jihad’s murder had the desired effect. Arafat was the man who inspired the Palestinian struggle, but Abu Jihad was the man who made it happen. Arafat was the man most respected by most Palestinians as the symbol of regenerated Palestinian nationalism, but Abu Jihad was the man the fighters and their families (the resistors of Israeli occupation) most admired. On an emotional as well as an organisational level, his murder was a huge setback for the resistance movement in the Occupied Territories. When the first intifada started Israelis had a choice of two options. One was to continue living by the sword. The other was to say to themselves something like: “If we are not to find ourselves in a nightmare situation of our own making, we had better negotiate our way out of occupation.” There were rational Israelis who did say such things. But gut-Zionism prevailed. It was congenitally incapable of responding to the Palestinian cry for even a minimum of justice with anything but the iron fist. Greater Israel was to be strengthened and consolidated, not dismantled, even at the price of there being no peace, ever. It was then that some of those who had done most to make a reality of Zionism’s mad dream did a most foolish thing. In the hope of weakening support for Arafat’s PLO in the Occupied Territories, they encouraged the growth of Hamas. The extent to which Israel assisted the development of Islamic fundamentalism (Palestinian style) is still a well kept secret. In retrospect it can be said that if Israel had been willing to accept Arafat’s PLO as a negotiating partner in the mid to late 1980s, Hamas in particular, and Islamic fundamentalism in general, could not and would not have emerged as an unmanageable threat to anybody in the context of the struggle for Palestine. In that context the real recruiting sergeant of Islamic fundamentalism (Palestinian style) for resistance was Zionism’s arrogance of power and insufferable self-righteousness. At some point, Israel crossed the line from possible negotiations to outright theft of 100% of Palestine and the destruction of the Palestinian people. Of course, you are right: Israel will never have "peace" which means, to Israelis, complete surrender of the native peoples to the Zionists. But why publish this now? It would seem that the presumably reluctant Israeli confession serves to resurrect the stereotypical image of the fearsome Palestinian terrorist at a time when the Palestinian resistance has long remained non-violent and they are embattled by the BDS and Free Gaza movements and trying to justify an attack against the current Islamic Demon, Iran. Israel is 64 years old today. By their political myopia, during his 64 years, its politicians and milataries have been constantly weaving the rope with which their country will be hanged. Another factor in the decline of the secular nationalist PLO was Gorbachev's late 1980s rapprochement with the West. The subsequent dismantlement of the Berlin Wall and in 1991 the collapse of the Soviet Union itself meant that the alternative economic model to capitalism represented by the Eastern bloc was no longer seen as tenable. This affected not just the PLO but every other secular nationalist movement and regime in the underdeveloped world. You know; I have always wondered; why it is; that Middle Eastern people oppressed by the zionists do not use the same strategies. Why doesn't for example; the Iranians have an assassination program? We know the Obama and the CIA have a kill lists and we know the zionists assassinate people all of the time. Why not hire people of every nationality to assassinate all israel government and military personnel that travel overseas? Fatah, PLO and Abbas are all creation of Israel and its western poodle - to keep a lid over the emergence of a true Islamic Resistance like Lebanese Hizballah. I have wondered much the same. Israeli agents pick off Iranian scientists seemingly at will. Why aren't Israeli scientists murdered by motorcycle drive by? Davey Wavey - Iran is 5000-old civilization. It was never based on culture of terrorism especially under the current Shri'ah-based government. In fact it were the European Jewish terrorist groups which introduced terrorism and anti-Semitism in the Middle East in the 1940s. “Our task is to recruit a barrier and once again put the fear of death into the Arabs of the area,” – Yitzhak Rabin, Israeli defense Minister (later prime minister of Israel). “Israeli interogators routinely ill-treat and torture Arab prisoners. Prisoners are hooded or blind-folded and hung by their wrists for long periods. Most are struck in the gentals or in other way sexually abused. Most are sexually assualted. Others are administered electric shocks,” – Ralph Schoeman, Sunday Times, June 19, 1977. “There is no country in the world in which use of official and sustained torture is an established and documented as is in the case of Israel,” – Amnesty International. Davey Wavey: Iran's preferred methodology is to go after civilians. Most of their attacks are prevented, like the New York plot, but there was a success e.g. in the killing of Israeli/Jewish civilians in Bulgaria this year. Syrian proxies Syria and Hizb'Allah are famous for the use of bombs and other violence to control political outcomes in Lebanon. Iran also kidnaps foreign civilians in Iran to use as bargaining chips and the current regime famously got its start via the totally illegal sacking of the US embassy. Brezinski - That doesn't rise to the level to which I am referring...true targeted assassinations. I consider the response disingenuous. As for the "totally illegal" capture of the US Embassy (ancient history at that), it's rather like say that the Boston Tea Party was "totally illegal" which it was. Why aren't Dimoni scientists shot by motorcycle drive by? Zionism has been distinguished from at the 1930's as a bloody assassination conspiracy involving very key diplomats and nowadays scientists etc. Yet the opposition, such as it is, has no such reputation: It's terrorism is pathetic by any measure compared to IDF lethality. Brezinscki says they kill civilians, as in Bulgaria. If so, it is a pathetic response to the key question. The truth is that Zionists reach into any state, kidnap anyone they cares to, spirits them out of the country to torture in Israel or elsewhere. Likewise, Zionists kill whoever they can reach that is valuable to their enemies and for which crime they can escape censure, the very minimum pr problem. Anyone inside Iran is fair game now as is virtually any Gazan they wish such as Dirar Abusisi,now kidnapped in Ukraine and spirited to Israel for no goddamn reason that could possibly matter given the incommensurate war against Gazan life. Israel has targeted and killed targets, high level individuals, for a long time. It is outright policy (talk about illegal!) Israel, the "national security state" without peer, must be seriously disciplined, whatever it takes. angrotom: "Zionists kill whoever they can reach that is valuable to their enemies ..."
"(Iran)... kill civilians, as in Bulgaria ..."
onto believes that killing civilians is better than killing/kidnapping specific, dangerous targets. Brad Brzezinski - Iran is not squeaky clean, they called for Salman Rushdie to be murdered. A freelance bomber acting on their behalf blew himself up in a rented room in London. However, that bears no relation to the systematic terrorism inflicted by the Zionists on nations all over the world. Israel has killed more Americans (two in the last 10 years) than Iran has been doing. Israel has killed many more British, Turkish etc than have the Palestinans, Iranians etc. Israel is not our friend and behaves like a terrorist nation far more than any other. William Smart: You are obviously consumed with hate for Israel and hence unable to argue rationally. As such I'll just (for fun) point out that Obama, by targeting Americans who are fighting for the jihadis, has killed far more Americans than has Israel. Also the core of your argument means that Germany was the good side in WWII because the Allies killed more people than did the Axis. Brezez "Consumed with hate for Israel" eh? A shoddy effort to make Smart appear irrational. Israel certainly inspires strong feelings, but the matter remains the targeted terrorist program of the Zionists, its reach and historic record. No terrorist entity comes close, not even the US. Zionism is tribal savagery in cosmopolitan dressing. Besides -- Israel can not justify its record by pointing to the other guys. For all its Western "values," it behaves like the Czar's secret police. Brad Brzezinski - when Israel hands over the 15 or more assassins who stole the identities of British people, and stops murdering British people and stops attacking cruise ships in the Med then maybe Israel could be our friend. Until that time, Israel is a rogue nation and an enemy of my country a great deal worse than is Iran. Meanwhile, your "consumed with hatred" jybe simply makes you look twisted and treasonous. Just William: I remind of the beginning of the Libya afffair when several British SAS were found with multiple foreign passports. It seems that Israel is not the only country to indulge in this behaviour and Britain had a lot of nerve criticising Israel for it at the time.